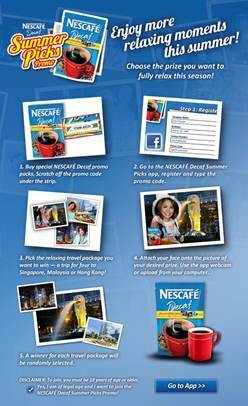 Fellow coffee lovers like me may want to join this wonderful and exciting promo from Nescafe Decaf! Buy special Nescafe Decaf Summer Picks Promo packs. Scratch off the promo code under the strip. Pick the relaxing travel package you want to win - a trip for four (4) to Hong Kong< Singapore or Malaysia. Attach your face onto the picture of your desired prize. Use the app webcam or upload from your computer. There will be bi-weekly winners of Sodexho GC's worth Php2,500 and Grand Winners of 3 exciting trips: Hong Kong, Singapore and Malaysia. Promo Duration is from March 1 to May 31, 2012.